As genealogists, we are living in a time when there are huge amounts of genealogy records being put online on a daily basis. We can do research in the comfort of our own homes with our pajamas and fuzzy slippers until 3 o’clock in the morning if we want. The truth is: It’s Not All Online! Unfortunately, many in the genealogy community have been lulled into thinking that everything is indeed online. That thinking must change and genealogists need to explore a variety of archives and repositories. 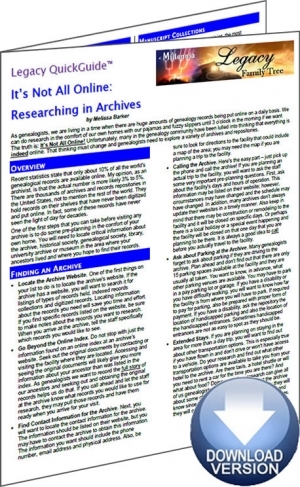 The It’s Not All Online: Researching in Archives Legacy QuickGuide™ contains useful information including how to find an archive and prepare for a visit, a list of record types and tips on research strategy, tips on making records requests, and more. Also included are links to websites and resources covering many archives and repositories for genealogical research. This handy 5-page PDF guide can be used on your computer or mobile device for anytime access.